Do you ship overseas?jdimeo2018-06-29T20:06:47-04:00We ship everywhere the USPS delivers mail. Our shopping cart is linked to the USPS website and automatically calculates the shipping fees associated with your order. Based on our experience, international delivery may take a couple of weeks. Do your products contain pesticides or chemicals? Do your products contain pesticides or chemicals?jdimeo2018-06-29T20:06:47-04:00No. Our products are free of solvents, GMOs, radiation, artificial colors, artificial preservatives, artificial flavors, herbicides, and pesticides. Zenberry products absolutely do not contain any animal products, dairy, egg, soy, added sugar, wheat, or yeast. How can I contact Zenberry? How do I know my transaction will be safe?jdimeo2018-06-29T20:06:47-04:00Our online shopping cart and security technology ensures the safest and most reliable checkout experience for our customers. Is Zenberry USDA certified organic? 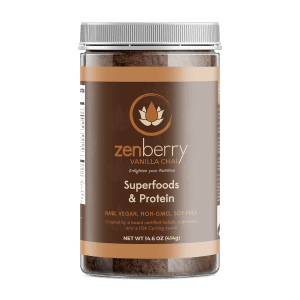 Is Zenberry USDA certified organic?jdimeo2018-06-29T20:06:47-04:00No. All Zenberry products are organic compliant but not all are certified USDA organic, at this time. Those who produce our ingredients and package our products are organic compliant according to NOP (National Organic Program) regulations, however, several ingredients are wild-crafted such as kelp and dulse. These ingredients are best grown in wild places, like the ocean, which are not able to be certified organic at this time. This makes an official USDA Certification impossible. Just because something is certified organic doesn't mean that it is of high quality. We are unwilling to compromise our mission to provide the highest quality, most nutrient dense ingredients for our customers whether "certified" organic or not. We stand by our products as being of the highest quality, free of pesticides, chemicals and GMOs, even if every single ingredient is not USDA certified. We continue to improve our products and remain open and transparent with our customers and we are pursuing a partial USDA Organic certification for those ingredients where it would be possible. What happens after I have placed my order?jdimeo2018-06-29T20:06:47-04:00Your order will be reviewed and mailed as soon as possible, using US Postal (USPS) Priority Mail services. Keep in mind that the Priority Mail shipping time starts when the package is dropped at the Post Office not from the time you place your online order. In the event of product shortage we will email you immediately and provide you with a fulfillment date. In the event of a Zenberry subscription, your order will be processed monthly. What is the best way to mix Zenberry? What is the best way to mix Zenberry?jdimeo2018-06-29T20:07:37-04:00Zenberry is best when mixed in a blender or a shaker bottle. It's harder to blend in a glass, stirred with a spoon, because it's made from whole foods which have not be processed beyond dehydration and grinding into a fine powder. Most powders that blend with a few stirs of a spoon have either been highly processed using chemicals and emulsifiers and/or are full of sugar which dissolves readily in liquid (think of your childhood chocolate milk powder). Any type of blender does a great job of mixing zenberry into the liquid of your choice. A shaker bottle works great on-the-go but give it a few extra shakes to be sure it's totally blended. Hey, those are extra calories you're burning while shaking! You're welcome. What is xanthan and pectin and why are they in Zenberry? What is xanthan and pectin and why are they in Zenberry?jdimeo2018-06-29T20:07:54-04:00Xanthan is a natural stabilizer and thickener. Xanthan is used in the brown rice protein found in Zenberry Green and is derived as a result of the biofermentation of brown rice. Pectin is a soluble dietary fiber found in apples and other fruits. It has a number of health benefits and is also a vegan alternative to gelatin. What is your refund or exchange policy?jdimeo2018-06-29T20:06:47-04:00We have a 100% satisfaction guarantee. Just return the unused portion of your order within 30 days for a full refund (minus shipping). What is your subscription program?jdimeo2018-06-29T20:06:47-04:00Zenberrry subscriptions allows customers to have their favorite Zenberry shipped to them automatically so they never run out. You save 10% off the retail price and get free shipping (within the continental US). Shipments and charges occur each month on the date you signed up. Cancel anytime.